A "before and after" comparison of the first SH-3D imported into Britain as a pattern for Westland production showing it (above) in RN markings as XV370 but retaining US-built engines and equipment and (below) after British engines and equipment had been fitted. Minor differences in external detail can be seen. Also for use in the search and rescue role, the German Navy has purchased 22 Sea Kings equipped to a very high standard. The Indian Navy's Sea Kings operate in the anti-submarine role and are almost identical with the Royal Navy versions. For the Japanese Navy, Mitsubishi is producing a batch of Sea Kings that are virtually identical with the Sikorsky SH-3D standard, although the original HSS-2 designation is retained in Japanese service. Norway is the third overseas customer for Westland Sea Kings, having placed a contract for 10. Purchased by the Ministry of Justice, they are operated by Skv 330 of the Royal Norwegian Air Force from bases around the Norwegian coast. 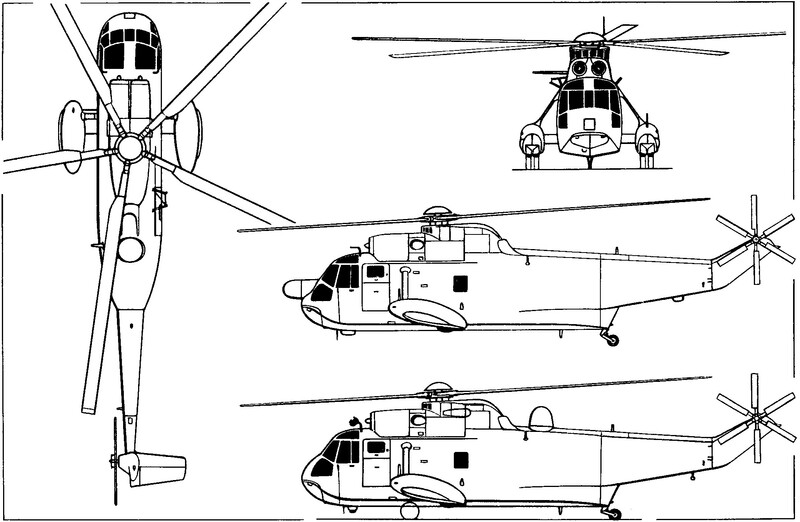 A three-view general arrangement drawing of the Westland Sea King, distinguished from all other versions of the S-61 by the dorsal radome, and an additional side view depicting the Agusta-built SH-3D with nose-mounted radar.